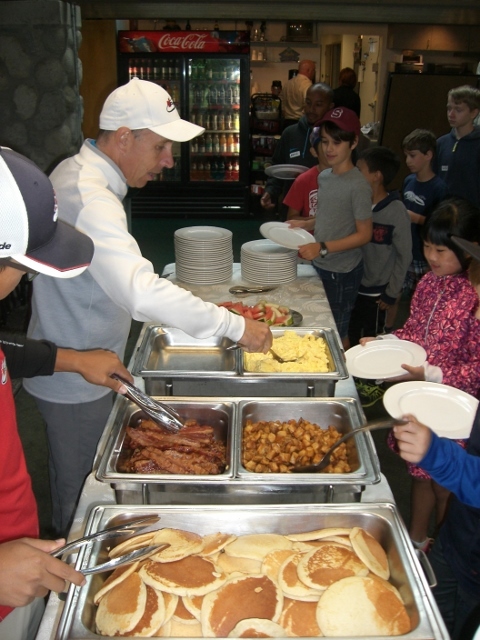 McCleery Golf Course's Inner City Youth Program in its 18th year. This program was developed to introduce the game of golf to children living in Canada's poorest neighborhood, the Downtown Eastside of Vancouver. Muncie Booth became the Head Golf Professional at Langara Golf Course in 1991 and McCleery Golf Course in 1998. He started the Inner City Youth golf program in 1999 to bring golf to children of the downtown Eastside. The program, which runs every August, will celebrate its 18th season in 2016. To get started in 1999 Muncie recruited the assistance of three Community Centers in the downtown Eastside area - Strathcona, Thunderbird, and Ray-Cam. Participants must be holders of a Leisure Access Card. The first year had its challenges, namely raising the $7,000 needed for buses and drivers, PGA of Canada Professionals, hot meals, snacks and refreshments, printed materials, prizes, gifts and trophies. The main source of funding at that time came from private individuals, the Men’s and Ladies’ Club members of both the McCleery and Langara Golf Courses, and a couple of small corporate donations. The popularity of the program grew very quickly, and over the years, Muncie was able to double the enrollment and the program now runs over two separate weeks, with younger kids attending the first week and olders participants the second. With this growth, came increased expenses and the annual budget grew to about $12,000. The program provides both short-term and long-term benefits for the children that participate. The golf experience teaches a new skill while at the same time encouraging other qualities that the game of golf celebrates - etiquette and respect, rules and self-policing, sportsmanship and getting along with others. Exposure to golf gets those who have special skills on the right track. Several years ago, the program even became long-term for one female participant when her natural ability and good attitude was recognized and the McCleery Golf Academy offered her a space in an ongoing junior group program at no cost. Her instructor has worked with the girl’s parents to get some equipment at a reasonable cost. The program is always in a fundraising stage in order to meet the annual $12,000 budget and is now able to provide an official tax receipt to any individual who wishes to contribute. There are no administrative costs to the program, as Muncie donates his time. This means that 100% of the monies raised go directly to covering the operational costs of the program. We would like to acknowledge Mr. Fred Clarke, who has been our main sponsor since day one. Also, in 2016 we are pleased to acknowlege other prominent local contributors, such as Ian Mansfield, former President of Telus and former Commissioner of the Canadian Tour; Mr. Jim Young, President of Woodtone industries; Mr. Ted Bowers, owner of Bowers Medical Supplies; Mr. Jay Young and One Under, and Bob Moon of Abbotsford Nissan. The West Point Golf Club increased their annual donation substantially this year and also made this program the receiptant of two 50/50 draws. Anyone interested in helping Muncie and the Inner City Youth Golf program can please contact Muncie Booth directly at 604-308-1317, or by email at munciebooth@shaw.ca.